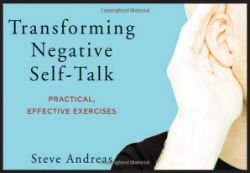 A toolkit of practical strategies for managing intrusive, negative self-talk and how you respond to it. Hearing a judgmental or disapproving internal narrative is a very common mental health complaint, and not always a sign of schizophrenia or another serious diagnosis. Persistent inner chatter and rumination can lead to depression, anxiety, phobias, trauma, obsessive-compulsive thoughts, and more. In this unique collection of practical, take-charge strategies, the author reveals how self-critical voices can actually be altered and used to your own advantage. Rather than changing the words themselves, Steve Andreas’s approach is to change how the words are spoken through specific, easy-to-implement techniques, such as changing the location of the voice; its distance from you; its tempo, tone, or volume; and much more. Unlike most therapies that advocate talking back or ignoring it, this guide offers exercises for viewing our self-talk as a useful and productive indicator of our emotions, and shows us how to take control of them in a more meaningful way. The second volume More Transforming Negative Self-Talk is also available from Amazon.com. 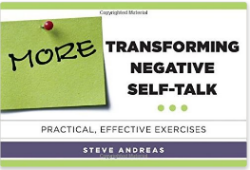 Be the first to review Transforming Negative Self-Talk!